There's not many mediums as powerful as film. It has the power to change hearts and minds, inspire action, and their staying power can remain present for a long long time. As an agency focused on bringing good things to life, the idea of self-initiated projects that amplify our mission has been appealing to us since the start. The first one in this series of came to life at the end of 2018 - a short film on the duality of climate change. Sometimes the best things come out of the smallest of actions. After years of wanting to work on a film, I decided to make it happen. It was that moment where a very thin but seemingly huge line between dreams and action was crossed. Just like that, out of a message on Facebook this film project started taking life. We had collaborated with filmmaker Sean Stiller before on our Greenpeace campaign project in 2017 and really enjoyed the experience. He has all the qualities we look for in our collaborators: dedicated, responsive, talented and most of all, a real joy to interact with. 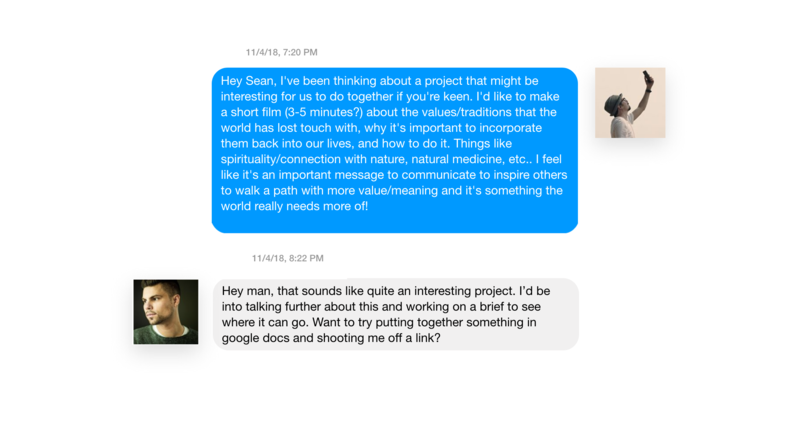 Looking back at that message to Sean, it reminds me of the power of intentions and how they can manifest into reality things that beforehand seemed like a reach. I'm amazed at how much that little seed planted triggered into existence: multiple iterations of concepts, five script versions, weeks of planning, hours of thinking, long days of shooting, new friendships, and so many other facets that come with the adventure of making a film. And for an adventure like ours exploring the duality of climate change, there was no better place I could think of other than Tofino to become the backdrop for it. With a loaded car full of filming gear, smoke bombs, and a 1920s TV we headed to my personal favorite place of all-time: Tofino. 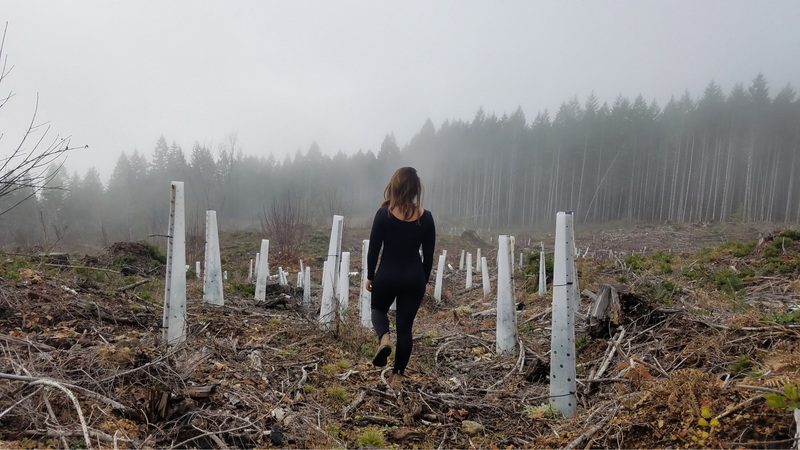 It isn't just a magical place, the remoteness of it was appealing to us because it would give us a sense of being completely immersed in the film, the elements, and the energy of the place. That kind of inspiring setting would also help us move away from a completely cerebral approach to the film where we would follow the script to the letter. Instead, it would help us move into a more heart-centered perspective that is naturally more open to inspiration and spontaneity. As long as the logical framework is there as a guide - in this case it was the script - that center of thinking often lends itself better to flowing into what comes up and listening to a more creative and intuitive voice. 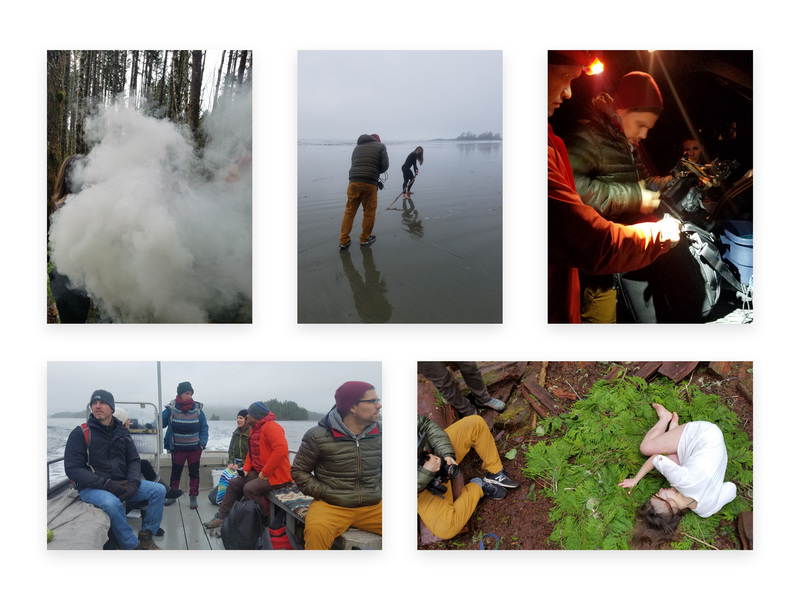 In total we had 4 full days of shooting on location and they were all really long, tiring, but extremely enjoyable. 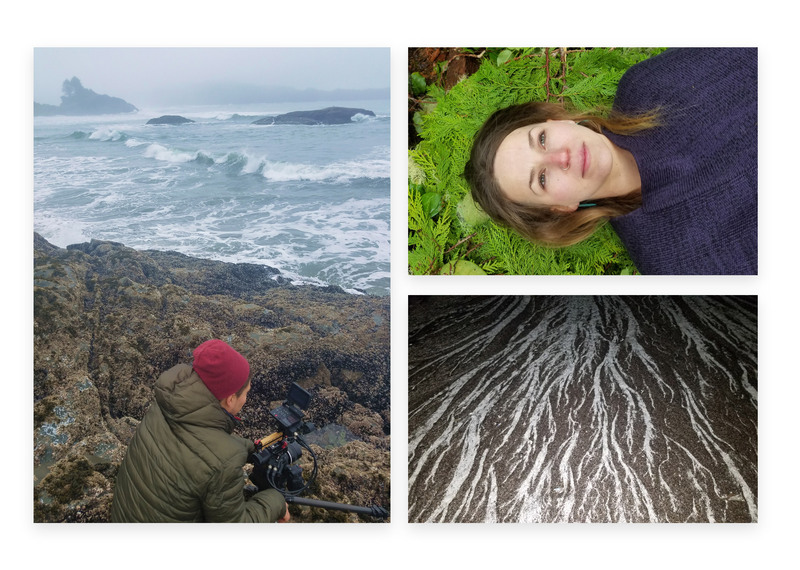 We filmed through crashing waves, foggy logged forests, epic old growth, dark and mysterious beaches at night, thorny bushes, cliffs, and thick smoke bombs going off right into our faces. We would wake up at 6:30am and finish our shooting at 9pm bruised and exhausted after trekking and lugging equipment around all the day. But the forests, the ocean, the air, the energy... there's nothing quite like the coast to energize you on a soul level - we felt really good inside! 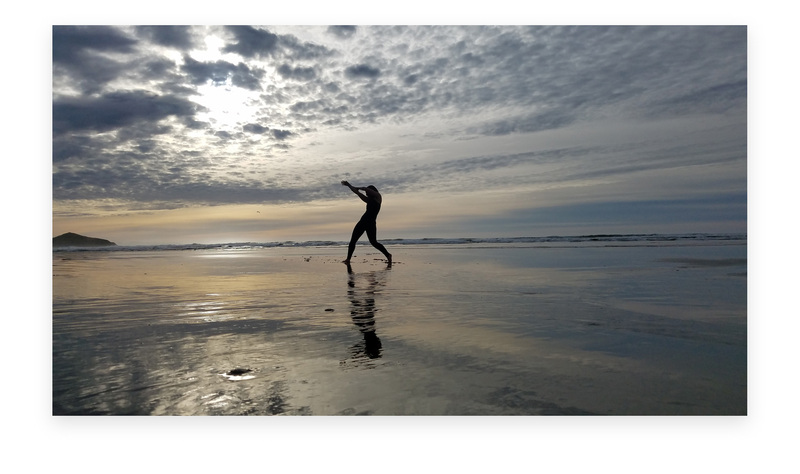 We spent a lot of our time on Chesterman beach filming Sacha dancing during the day and sometimes in the near pitch darkness of the moonlit beach. People I meet during the process of creating something is always my favourite part of the experience and this was no different than other projects. Sacha is a wonderful person I met for the first time looking for a dancer for the film. She teaches dancing, is a mother of two living in a tiny home, and she makes cute little wooden sculptures. During the production we asked a lot out of Sacha. She was a force of strength during the shoot by braving the elements in the middle of January and the long and demanding hours of shooting, dancing, and acting in challenging and uncomfortable settings. We couldn't have made the film without her! Aside from Chesterman beach, an important spot for us was the magical Meares Island on Tla-o-qui-aht territory. The massive cedars that reside there were a backdrop to many of the scenes in the film. After a short boat ride there you're immediately taken by these beautiful ancient tree beings who overlook the place. Being there feels like a throwback in time, before all the logging in British Columbia came into existence. The ancient trees reminded us of how priceless old growth forests are and the importance of protecting them. It's hard to write a brief blog post about the making of this film. There's so much good energy, stories, and experiences that are generated when a passionate group gets together around a shared vision and message. And its a timely message. We are all going through uncertain times and the choices we make in how we navigate them as we move forward is important for our well-being. We intentionally set the film as a balanced story that acknowledges both the dark and the light of the situation we are in because there is no certainty on where it is going. It could be really good or it could be really bad. And that's alright. The grief, sadness, and frustration are there to show us how important this moment is for us and those unpleasant emotions are there as valuable contrast for the joy, connection, and hope that we all carry inside of us. The way out of the danger zone for our planet's climate may not always be clear or easy, but as individuals we have an important to play in its recovery by always coming back home into our hearts and feel grateful for this planet that gives us our every breath.